This page summarises the key information in the 2015 Household Incomes Report, published by the Ministry for Social Development. On most measures, income inequality is either at the highest level it has been since records began in 1982, or is very close to that level. It has also risen sharply in both the last two years. 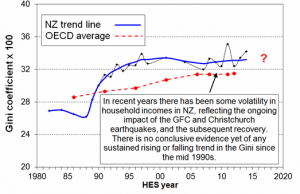 The government generally claims that inequality is not increasing. 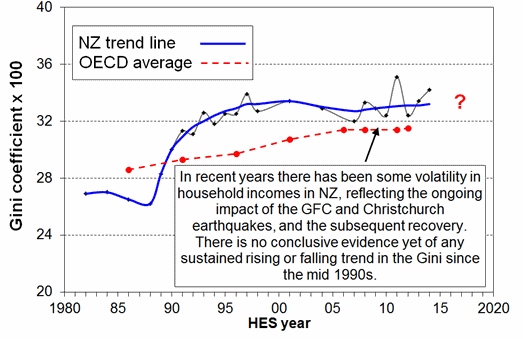 The Household Incomes Report, which is quite rightly cautious, continues to say there is no “conclusive” evidence of rising inequality. But as the graph below of the Gini coefficient shows (in which 0 is perfect equality and 100 is perfect inequality), it is starting to look like an upward trend, and the Report says that one more year of data at this level will be enough for it to conclude that inequality is indeed rising. One way to look at what has happened with income inequality recently is to consider the contrasting fortunes of different groups, as in the table below. Total poverty has been relatively steady since the global financial crisis, under the measures that look at how many households (HH) have less than 50% or less than 60% of the typical household’s income (adjusted for household size). However, poverty is far higher than in the 1980s. On the under 60% figure, and assuming a population of 4.42 million, there are approximately 880,000 New Zealanders in poverty. When housing costs are taken into account, the above trends and figures are roughly the same, with the difference that the under 50% rate has gone from 13% in 2009 to 15% in 2014, indicating that housing costs make the biggest difference among the very poorest, and are increasing. After housing cost poverty is roughly double its 1980s level, again pointing to housing’s growing role. There are many different measures for child poverty, as the table below shows. However, the overall trend is for an increase in child poverty of somewhere between 10,000 and 45,000 children since 2009. The exception is the ‘anchored line’, which looks at how many children are under the 2007 poverty line (as opposed to how many are under today’s poverty lines). But even here, where one would expect poverty to decline consistently as the economy grows, the figures look static.